Melody and Mike held their reception at the Hilton on February 20th in the Chief Illiniwek Ballroom. They put their cake from the Cake Artist’s Studio on the middle of the dance floor, and we put a spotlight on it. Then we put their monogram on the dance floor in front of the cake. This is what their guests saw as they entered the room.. They took the cake away before the dancing started, and then we used the spotlight for their first dance. 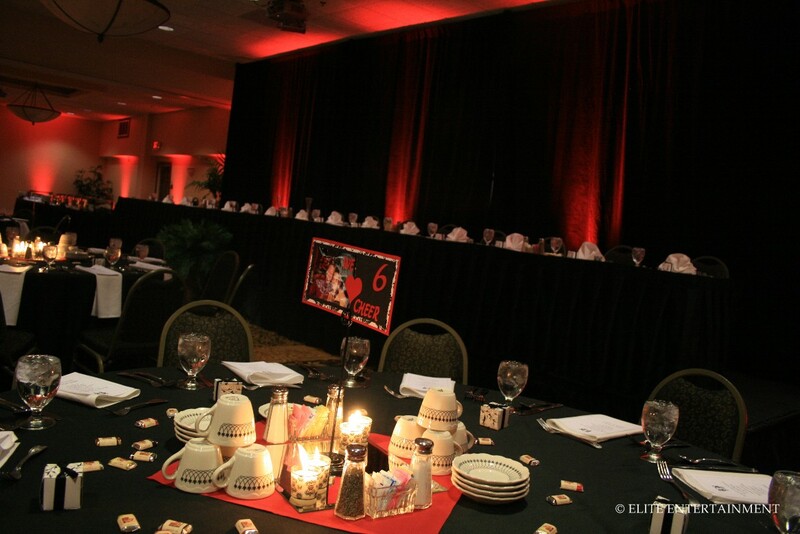 The Hilton has a nice black backdrop that they use behind the head table. Melody’s colors were red, black, and white. So we did red up-lighting. She used black floor-length tablecloths through us as well. ~ by Elite Entertainment on February 25, 2010. This entry was posted on February 25, 2010 at 10:15 am and is filed under Hilton.You can follow any responses to this entry through the RSS 2.0 feed.You can leave a response, or trackback from your own site.